The operation and follow-up treatments left Kennedy thinner, prone to seizures, weak and short on energy, and hurt his balance. Kennedy made his first post-illness public appearance on July 9, when he surprised the Senate by showing up to supply the added vote to break a Republican filibuster against a bill to preserve Medicare fees for doctors. 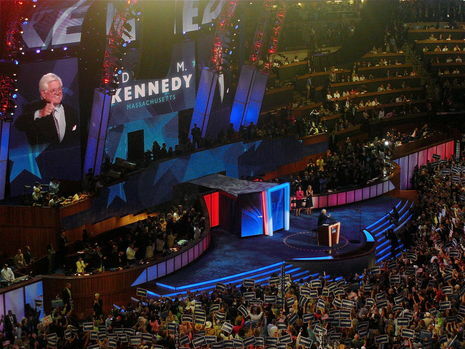 Though additionally ill from an attack of kidney stones and against the advice of some associates, Kennedy insisted on appearing during the first night of the 2008 Democratic National Convention on August 25, 2008, where a video tribute to him was played. Introduced by his niece, Caroline Kennedy, the senator said, "It is so wonderful to be here. Nothing – nothing – is going to keep me away from this special gathering tonight." He then delivered a speech to the delegates in which, reminiscent of his speech at the 1980 Democratic National Convention, he said, "this November, the torch will be passed again to a new generation of Americans. So, with Barack Obama and for you and for me, our country will be committed to his cause. The work begins anew. The hope rises again. And the dream lives on." The dramatic appearance and speech electrified the convention audience, as Kennedy vowed that he would be present to see Obama inaugurated. The senator’s arrival, first reported by NBC News but confirmed by Politico Monday, added a note of surprise and an emotional high to what’s typically a carefully staged affair. Barack Obama's campaign has been hoping for a surprise appearance in the convention hall by the ailing party elder who has sought to pass his family's torch to the young senator from Illinois with a January endorsement that electrified his campaign.